A meeting of Toronto trail supporters, developers, managers and enthusiasts leading to more and better trails in Toronto! Top Reasons Why You Should Attend Trailhead Canada – Please share! 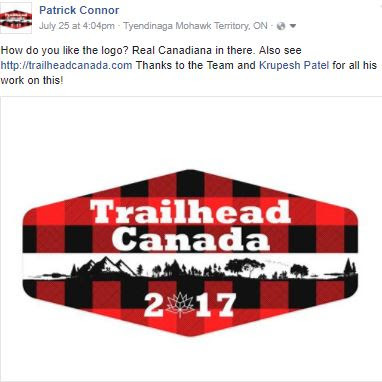 HI – I am writing you as Co-Chair of the Trailhead Canada Trails Event taking place in Ottawa November 21-23, 2017. If you are a trail user, manager, marketer or builder, I want to encourage you to attend this national trail event. 6) As an Activity leader you can join other Activity leaders, hiking, snowmobiling, cycling, mountain biking canoe and kayak, climbing, cross country and equestrian. 7) Attendees can learn from experts in various ares of trail development, management and operation. 9) Networkers are present to build your national connectivity and connections. 10) Enablers are on site to assist with your local, design, build management, attraction, conflict or advocacy. National events like this only happen once every 20 years. Make this your time to have a say in Canadian trails. 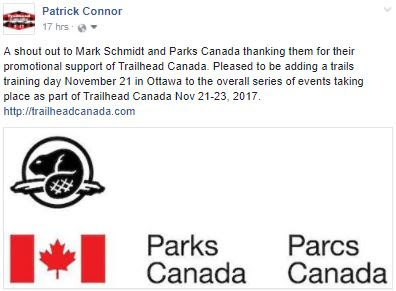 Parks Canada Partnering in Support of Trailhead Canada! Share the logo on your website – show your support for Canadian Trails!